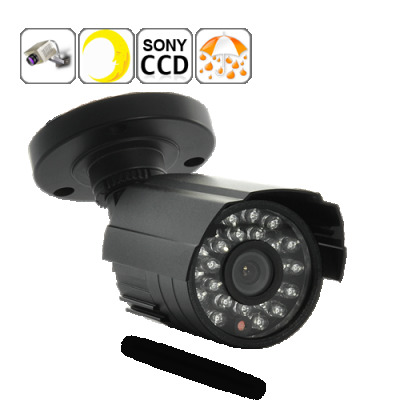 Successfully Added Mini Security Camera with 1/3 Sony Interline CCD (Infrared, Waterproof) to your Shopping Cart. Miniature surveillance camera with powerful 1/3 inch Sony Interline CCD for protecting your home or office- anywhere, anytime! The Mini Security Camera is a powerful yet small security camera that doesn’t draw attention, seamlessly blending in with its surroundings. It is the perfect solution for people who don’t want to install large security cameras that will ruin their home or office decor, but at the same time want to capture crisp, colorful and detailed video images. This Mini Security Camera uses the best surveillance technology around, Sony Interline CCD sensors. The reason a Interline CCD sensor gives you better image quality than standard CCDs is because Interline technology allow more light to reach the sensor. As a result, this improves the clarity of your images while at the same time reducing noise (graininess), giving you perfect images at both day and night. Monitor Your Home and Business Anywhere, Anytime! The Mini Security Camera also features a completely waterproof cast aluminum casing with sliding hood to keep rain and snow from blurring the lens. For night time recording it uses 24 powerful IR LEDs to capture detailed video during total darkness and up to 20m away. Combine all of this with the Sony Interline CCD and you have yourself a professional surveillance solution that competes with cameras four times the size! This amazing surveillance camera comes with our famous 12 month warranty and is available with a factory direct wholesale price that can’t be beat. Order Mini Security Camera now while it is in stock and ready for next day shipping. Available only from the leaders in factory direct wholesale electronics, Chinavasion. Performs just as good as security video cameras from Samsung, Panasonic, Vitek, IQ or Messoa, but comes at half the size and a fraction of the price.